In the program my talk at the IIPC's 2016 General Assembly in Reykjavík was entitled Emulation & Virtualization as Preservation Strategies. But after a meeting to review my report called by the Mellon Foundation I changed the title to The Architecture of Emulation on the Web. Below the fold, an edited text of the talk with an explanation for the change, and links to the sources. Its a pleasure to be here and I'm grateful to the organizers for inviting me to talk today. As usual, you don't need to take notes or ask for the slides, the text of the talk with links to the sources will go up on my blog shortly. 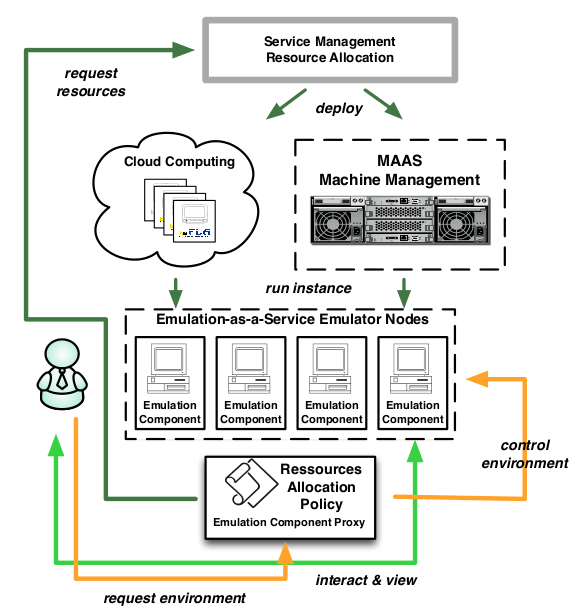 Thanks to funding from the Mellon Foundation I spent last summer on behalf of the Mellon and Sloan Foundations, and IMLS researching and writing a report entitled Emulation & Virtualization as Preservation Strategies. Jeff Rothenberg's 1995 Ensuring the Longevity of Digital Documents identified emulation and migration as the two possible techniques and came down strongly in favor of emulation. Despite this, migration has been overwhelmingly favored until recently. What has changed is that emulation frameworks have been developed that present emulations as a normal part of the Web. Last month there was a follow-up meeting at the Mellon Foundation. In preparing for it, I realized that there was an important point that the report identified but didn't really explain properly. I'm going to try to give a better explanation today, because it is about how emulations of preserved software appear on the web, and thus how they can be become part of the Web that we collect, preserve and disseminate. I'll start by describing how the three emulation frameworks I studied appear on the Web, then illustrating the point with an analogy, and suggesting how it might be addressed. When I gave a talk about the report at CNI I included live demos. 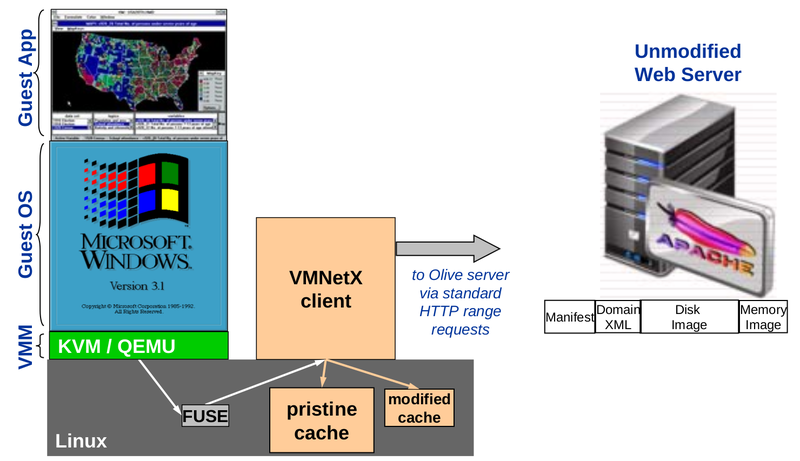 It was a disaster; Olive was the only framework that worked via hotel WiFi. I have pre-recorded the demos using Kazam and a Chromium browser on my Ubuntu 14.04 system. From 1995 to 1997 Theresa Duncan produced three seminal feminist CD-ROM games, Chop Suey, Smarty and Zero Zero. Rhizome, a project hosted by the New Museum in New York, has put emulations of them on the Web. You can visit http://archive.rhizome.org/theresa-duncan-cdroms/, click any of the "Play" buttons and have an experience very close to that of playing the CD on MacOS 7.5 . This has proved popular. For several days after their initial release they were being invoked on average every 3 minutes. bwFLA's preserved system images are stored as a stack of overlays in QEMU's "qcow2'' format. Each overlay on top of the base system image represents a set of writes to the underlying image. For example, the base system image might be the result of an initial install of Windows 95, and the next overlay up might be the result of installing Word Perfect into the base system. Or the next overlay up might be the result of redaction. Each overlay contains only those disk blocks that differ from the stack of overlays below it. The stack of overlays is exposed to the emulator as if it were a normal file system via FUSE. 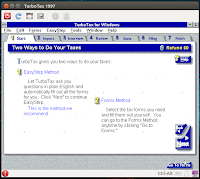 I can visit https://olivearchive.org/launch/11/ and get 1997's TurboTax running on Windows 3.1. The pane in the browser window has top and bottom menu bars, and between them is the familiar Windows 3.1 user interface. 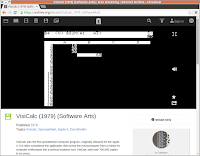 You can visit https://archive.org/details/VisiCalc_1979_SoftwareArts and run Dan Bricklin and Bob Frankston's VisiCalc from 1979 on an emulated Apple ][. It was the world's first spreadsheet. Some of the key-bindings are strange to users conditioned by decades of Excel, but once you've found the original VisiCalc reference card, it is perfectly usable. The quality of the others is mixed. Resources for QA and fixing problems are limited; with a collection this size problems are to be expected. Jason Scott crowd-sources most of the QA; his method is to see if the software boots up and if so, put it up and wait to see whether visitors who remember it post comments identifying problems, or whether the copyright owner objects. The most common problem is the sound. There's another interesting thing about PDFs on the web. In many cases the links to them don't actually get you to the PDF. 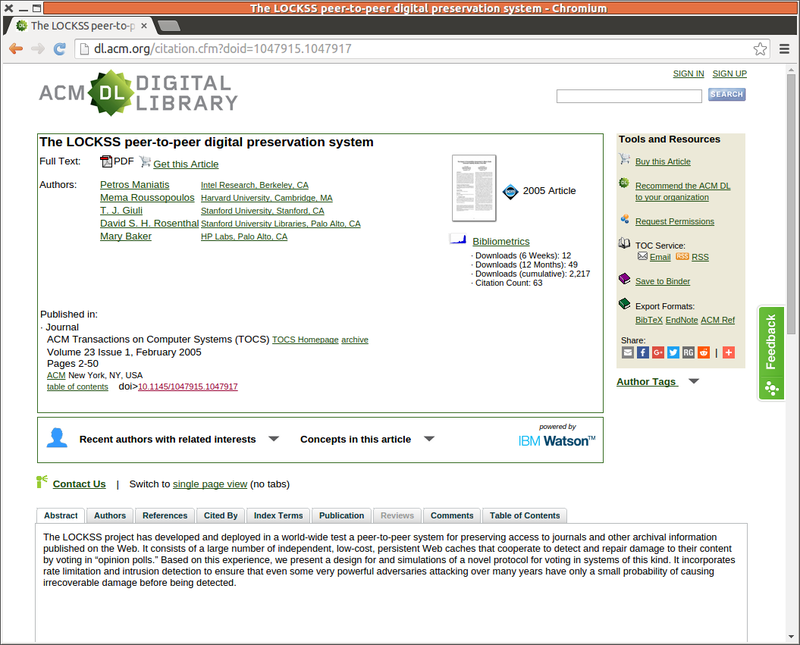 The canonical, location-independent link to the LOCKSS paper in ACM ToCS is http://dx.doi.org/10.1145/1047915.1047917, which currently redirects to http://dl.acm.org/citation.cfm?doid=1047915.1047917 which is a so-called "landing page", not the paper but a page about the paper, on which if you look carefully you can find a link to the PDF. The fact that it is very difficult for a crawler to find this link makes it hard for archives to collect and preserve scholarly papers. Herbert Van de Sompel and Michael Nelson's Signposting proposal addresses this problem, as to some extent do W3C activities called Packaging on the Web and Portable Web Publications for the Open Web Platform. No it isn't. We have a problem that is analogous to, but much worse than, the landing page problem. The analogy would be that, instead of a link on the landing page leading to the PDF, embedded in the page was a link to a rendering service. The metadata indicating that the actual resource was a PDF, and the URI giving its location, would be completely invisible to the user's browser or a Web crawler. At best all that could be collected and preserved would be a screenshot. All three frameworks I have shown have this problem. The underlying emulation service, the analogy of the PDF rendering service, can access the system image and the necessary metadata, but nothing else can. Humans can read a screenshot of a PDF document, a screenshot of an emulation is useless. Wrapping a system image in an emulation like this makes it accessible in the present, not preservable for the future. If we are using emulation as a preservation strategy, shouldn't we be doing it in a way that is itself able to be preserved? What we need is a MimeType definition that allows browsers to follow a link to a preserved system image and construct an appropriate emulation for it in whatever way suits them. 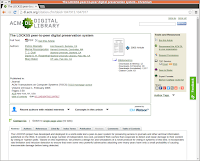 This would allow Web archives to collect preserved system images and later provide access to them. A disk image MimeType, say DiskImage/qcow2, with the contents of each of the disks. Emulation/MachineSpec is pretty much what the hardware part of bwFLA's internal metadata format does, though from a preservation point of view there are some details that aren't ideal. For example, using the Handle system is like using a URL shortener or a DOI, it works well until the service dies. When it does, as for example last year when doi.org's domain registration expired, all the identifiers become useless. I suggest DiskImage/qcow2 because QEMU's qcow2 format is a de facto standard for representing the bits of a preserved system's disk image. The emulated system image would not be wrapped in a specific emulator; the browser would be free to choose appropriate, up-to-date emulation technology. The emulated system image and the necessary metadata would be discoverable and preservable because there would be explicit links to them. The details need work but the basic point remains. 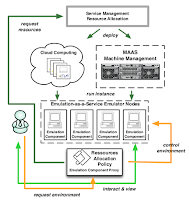 Unless there are MimeTypes for disk images and system descriptions, emulations cannot be first-class Web objects that can be collected, preserved and later disseminated. One of the problems my report on emulation highlighted was the mismatch between the hardware much of the software being emulated was designed for (the PC or even the tablet) and the harwdare it will be emulated on in the future (the phone). The reason is that the PC and tablet market is in free-fall, for at least the last 6 quarters, according to Canalys. The PC market is back to levels of 5 years ago. "The firm now says PC shipments “... are forecast to decline by 7.3% year over year”. That's “roughly two per cent below earlier projections as conditions have been weaker than expected.” The firm names “weak currencies, depressed commodity prices, political uncertainty, and delayed projects” as the weaker conditions impacting sales." "Windows 10 isn't helping matters either, because lots of people are availing themselves of free Windows 10 upgrades rather than buying a new PC. The firm also says that “while a large share of enterprises are evaluating Windows 10, the pace of new PC purchases has not yet stabilized commercial PC shipments.”"
My emulation report noted that there are issues with QEMU's support, including regressions in its emulation of older hardware. There have also been a number of security vulnerabilities, highlighted by the decision to remove QEMU from Google Cloud.